If you love playing games as much as many of us in Techradar Towers do, you’ll no doubt like the idea of a souped-up machine to handle your on-the-go gaming needs in 2017. There is a bewildering selection of gaming laptops available this Christmas, so we’ve put together a selection of our highest-rated gaming laptops to help you make the most informed choice when purchasing your next portable powerhouse. Razer’s attention to detail and engineering nous is plain to see in the latest version of the Razer Blade. We hailed it the “Macbook Pro of Windows Laptop” - a fine accolade that gives you some idea of the design and build quality you should expect. It’s not all show and no go with the Blade, however, as the capable i7 processor and latest GTX 1060 Pascal chipset from Nvidia ensure that there’s plenty of performance to boot. While it may not be the most well-known or cheapest choice available, the Aorus X5 v6 has all the power you’ll need for the playing the latest games on the move. You can choose from a top-end range of i5 or i7 processors, combined with the NVIDIA GTX 1070M, which is based on the latest Pascal architecture that you’ll find in the very best gaming laptops in 2017. The HP Omen 17 may not have the most solid build quality among other gaming laptops in its class, but the otherwise stellar specifications packed into this 17-inch gaming laptop make it genuinely great value for money. A speedy 6th gen Intel Core i7 is combined with Nvidia’s latest GTX 1070 graphics chip driving a 4K screen - a beastly specification for an affordable price, that any gamer can appreciate. If you are looking for a gaming laptop with the perfect balance between portability and power, the Asus ROG Strix GL502 strikes the sweet spot on most fronts. In its 1.2-inch chassis, this 15.6-inch laptop packs in a Nvidia GTX 1070 with 8GB of video memory, a card we're more used to seeing in 17-inch monster machines like the Gigabyte P57X. Beyond parts and measurements, this gaming laptop is a fantastic all-rounder that has style, a great keyboard, responsive touchpad, potent speakers and a screen with particularly pleasing colour reproduction. The Gigabyte Aero series may look like an Ultrabook, but the latest refresh in the range now includes a GTX1060 GPU paired with a Skylake Intel Core i7-6700HQ processor, up to 32GB of RAM and either 512GB or 1TB of SSD Storage. Whilst the QHD 14-inch IPS display may not be the largest, it packs an impressive amount of pixels, and can output to two external 4K monitors at 60Hz, should you need the screen real estate. Choose the most fully-loaded configuration of the new Alienware 13 R3 and you’ll have more power than has ever previously been possible to fit into a 13-inch chassis. 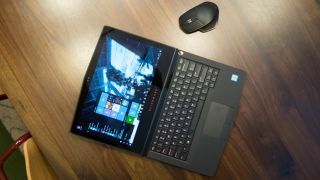 As well as speedy i7 processor and an Nvidia GTX 1060, options include a stunning QHD OLED touch screen with anti-glare technology - a simply gorgeous screen that is amongst the best you’ll find on any laptop, anywhere. As you would expect from Alienware, the 13 R3 is beautifully engineered and feels incredibly solid. If you are looking for a particularly portable gaming machine, this has to be top of your list. If money's no object and you are looking for a gaming laptop to entirely replace your desktop PC, then the Origin EON17-SLX is the premier choice. It’s a huge, weighty system that packs an incredible specification that will make any game absolutely fly. Simply put, if you don’t want to compromise on performance, or haven’t got the room for a full-size gaming PC, then this gaming laptop is for you. The Asus ROG G701 VI is the latest Republic of Gamers notebook from the Taiwanese outfit, and packs an incredible set of components that any gamer would be happy to have in their desktop, let alone a laptop. Highlights include the beefy Pascal-based GTX 1080 from NVIDIA, married to a 120Hz display, and an overclocked Core i7-6820HK processor that can be pushed all the way up to 4.1GHz! There’s also up to 64GB of RAM and either a 512GB or 1TB SSD to provide plenty of incredibly speedy storage for your games. Lenovo’s latest gaming-centric IdeaPad certainly looks the part, though it does not have the very latest NVIDIA graphics, instead “settling” for the older GeForce 980M GPU. Whilst this means it doesn’t quite keep up with the newer 1070 or 1080 chips, it can still fly through any game at 1080p whilst remaining cool and quiet. It also packs some incredibly loud speakers and one of the best keyboards we’ve ever seen on a gaming laptop.